The Ukusiza Project has uplifted the spirits of a number of small Ermelo farmers in Mpumalanga who are now able to become big commercial farmers. These new farmers have one goal - they aim to change from subsistence farming (meeting their personal needs) to farming to make money. The Ukusiza Project helps them to breed cattle which are suited to the conditions of the area. Ukusiza is a Zulu word meaning to “reach out”. The Ukusiza Project was started by the Department of Agriculture to reach out to farmers in the Ermelo district and to help them improve their lives. Sixty one small farmers have been given some Sanganer cattle for a certain period of time. When the cows have calves, the small farmers are allowed to keep the calves. The breeding cows are then given to another small farmer who will also keep the calves born during that period. This system is repeated until all the small farmers receive their fair share. In this way, a number of small farmers have not only gained calves, but also valuable experience in farming with cattle. 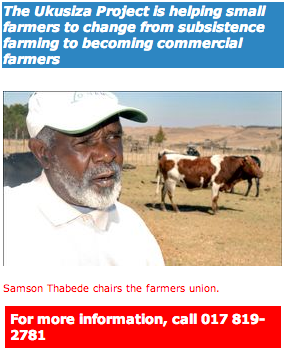 Samson Thabede, who is also the chairperson of the farmers union, said so far he got nine calves from the project. He is also the proud owner of 13 cows, but says to be successful he needs more. “I believe that with time my stock will grow. More cows means that I can sell some of them and buy a large farm,“ Thabede said. Sabeth Mathebula’s greatest wish is that the project should continue. She said she could not wait for the donated cows to give birth so that she could forward them to another member after keeping the calves. “There are no jobs and the only way to fight poverty is for the community to work together in order to improve our situation,” she said. Aaron Shongwe is hoping that the project will help him to improve his life and to take better care of his children. For Marvis and Hezekiel Hlatshwayo the project is a blessing. They already own 21 cows. After selling some of their cows, the couple has managed to send their daughter to a tertiary institution to further her studies. “We hope that these cows will have calves to add to our stock. There are no jobs and farming is the only means of survival for us. But we don’t just want to survive, we want to be able to earn a good living from farming,“ the couple said.